Explanation: Orbiting 400,000 kilometers above the Earth, the Moon slid into Earth's shadow to begin last week's total lunar eclipse. Of course the International Space Station (ISS) slides into Earth's shadow every 90 minutes, the time it takes it to complete one orbit at an altitude of about 400 kilometers. 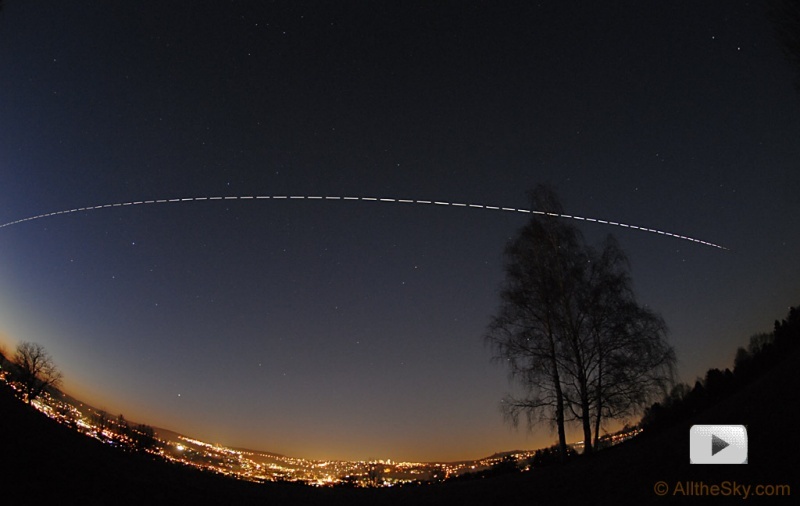 Recorded near sunset on February 7, looking toward the north, this composite of 70 exposures shows the trail of the ISS (with gaps between exposures) as it moved left to right over the city of Tübingen in southern Germany. Beginning in sunlight on the left, the ISS vanishes as it enters Earth's shadow at the far right, above the northeastern horizon. As seen from Tübingen, the passage took about 4 minutes. Clicking on the image will download a time-lapse animation (mpg file) based on the individual exposures that includes a plane flying along the horizon.